Another mini album.....this time one shaped like an apple and dedicated to preserving the memories of my daughter's 1st grade year. I'm not sure but that this one was the most fun yet.....but maybe because I love school themed things anyway?!?! I made my own template by "blowing up" an apple in my print shop program which I printed and traced onto cereal boxes. The rest was easy --- matching up paper and embellishments and adding pictures. I got a few of my illustrations for a Mary Engelbreit Daily Calendar, used some of my daughters actual work on some pages, and purchased a school themed paper pack at Michael's for the rest. 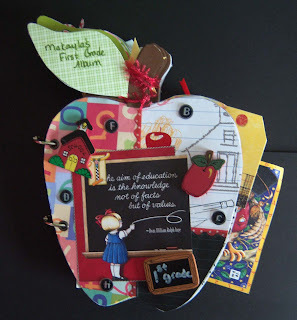 I found three wooden teacher themed embellishments in my stash and added them to the cover. It's nearly impossible to give a complete list of supplies as I'm not that detailed on a project this big...sorry! If you come back tomorrow I'll show you a few of the inside pages.